The plan here is to list and evaluate the books about Mondrian and make some suggestions on where to get them. As the Great Mr Zappa said, "writing about music is like dancing about architecture", and a similar principle applies to art. I am not much interested in the more pretentious analyses of Mondrian's works and so theoretical books do not appeal to me particularly. What we do need, though are quality reproductions of as many works as possible, and interesting details about his life and working methods. Listed below are the books I have and my opinions of them. All prices are correct at the time of writing and will be updated occasionally. The books are listed below and a range of sources at the bottom of the page. Here's mine, an exploration of the possible structures and colours of the twenty-four lost abstracts. There is only one copy in existence, but the story behind it is here. I suppose all lists of Mondrian books should begin with the Catalogue Raisonné by Joosen and Welsh , published by Abrams, 1998. This 1100 page, two-volume work is the most comprehensive on the subject and must set the standard by which others are judged. It seeks to show and describe every Mondrian work, although a disappointing number of the 1300 illustrations are in black and white rather than colour. It also details his life and exhibitions. It is rather disparaging about some of the competition. It is out of print at Amazon at the moment, but they are listing links to used copies. This is probably the second best known book on the subject and was the first major attempt to document all of Mondrian's paintings. It is written in a straightforward, conversational way by a friend of Mondrian and presents a fascinating background to the pictures. 445 pages, 606 illustrations, 34 tipped-in colour plates. There was a number of editions in several languages and the list was extended (and the numbering system tinkered with) as they were published. I paid $30 plus $11 shipping to England, which looks like a pretty good deal compared to some I have seen. Thanks to Brannan Books, Garberville, CA. One interesting feature of the book is an appendix showing how PM's signature changed over the years. The second attempt to document all of Monrian's works, after Seuphor. The Catalogue is dismissive on this one, little more than a listing of Mondrian's painted works, but, with few exceptions, it is limited to works known to the author from reproductions only and which could could thus be accompanied by illustrations. Nevertheless, I find it a jolly interesting and worthwhile work (espcially in the context of its time), simply through the juxtoposition of images. For me, the main downside is that it is written in Italian. An authoritative biography and, for the time, well illustrated. Detailed biography, good analysis of images and large format provides excellent colour illustrations. Many illustrations (several biographical items I have not seen before) and some interesting articles. As the advertising copy states, the author 'spent 30 years' researching the book, visiting Mondrian's friends and associates, museums and exhibitions: it is a labour of love. As with Milner, it is large format and lavishly illustrated and here the author has contribed many of the	illustrations. The second half of the book deals with Mondrian's influence on his contemporaries and subsequent American artists, often quoting their remeniscences of and reactions to Mondrian's work. This should be on every enthusiast's shelf. All in French, but a beautifully illustrated book. A reconstruction of the studio which Mondrian occupied in Paris from 1921-36. Brilliant. How do you get a job doing that? I believe the cover is using this font. This must have been my first Mondrian book and it is probably all most people need. This was my second decent book on PM, remaindered at £25. It was published in 1994 to coincide with the an exhibition which was held serially in the Haags Gemeentmuseum (Dec 94 - Apr 95), Washington National Gallery of Art (Jun - Sep 95) and MoMA (Oct 95 - Jan 96). 400 pages, 180 works pictured in colour and discussed in detail, with 110 B&W. This book obviously concentrates on the flower paintings Mondrian produced earlier in his career and again later when he needed some quick sales. Excellent illustrations, 57 in colour. This seems to have gone out of print quite recently. I paid $15 for a copy on eBay, but I have seen some selling at silly prices since then. The flower paintings are often considered mere 'pot-boilers' Mondrian produced to make some money, but Shapiro ascribes greater significance to them as a relief from the Compositions he was painting simultaneously and also as sensual sublimation. I'm not sure I agree with him, but it is a well produced book with excellent illustrations. Another book specialising in a subset of PM's work, issued in connection with an exhibition, but a book in its own right. A very interesting and detailed study. Second hand copies are readily available. This documents (in Dutch) the greatest collection of Mondrians there is, in the Hague's Gemeentemuseum. It is available from the museum shop. One feature I particularly enjoy is the many closeups showing the brushwork on a variety of pieces. from the Abrams Great Modern Masters series. A short analysis and good images, including four I have not found elsewhere. I bought this because it was cheap ($5) and because I am rather Mondrian-obsessed. I don't suppose I will ever read it through, but it is interesting to dip into occasionally. "Not for the casual reader", as the Amazon review states, although the book starts with two excellent articles from Holtzman and James. A CD rather then a book and available very cheaply on eBay at the time of writing (December 2010). The sales pitch reads, "This interactive CD-ROM offers you information on all Mondrian's life and work. Enjoy his most renowned paintings and the story about his personal life. Listen to the music that was very inspiring to Mondrian. You can even finish Mondrian's last painting 'Victory Boogie Woogie'"
The system is fun, if clunky, but the main attraction is that it offers images of a large number of paintings, some of which I have not been able to source elsewhere. [Feb 2012] A correpondent reports that the software is incompatible with recent versions of Windows, so I guess you should only buy for the many images of paintings. 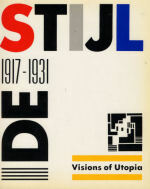 This is a delightful book covering the key De Stijl members, one by each of the authors. The subjects are Theo van Doesburg, Mondrian, Vilmos Huszár, J.J.P.Oud, Bart van der Leck, Jan Wils, Robert van't Hoff, Georges Vantongerloo and Gerrit Rietveld. It is well written and illustrated but with disappointingly few colour illustrations. Contains essays by Manfred Bock, Kees Broos, Martin Filler, Kenneth Frampton, Martin Friedman, Ger Harmsen, Joop Joosten, Rudolf W.D. Oxenaar, Serio Polano, Nancy J. Troy, Robert P. Welsh. Similar in content and style to the book above, this was published for the exhibition of the same name at the Walker Art Centre in 1982. It has more colour illustrations, but I would find it difficult to choose between the two in terms of the interest and quality of the articles. Both highly recommended. There are a surprising two novels dealing with a Mondrian painting and two found later which include a Mondrian theme. This is an excellent crime novel in the Bernie Rhodenbarr series with a Mondrian at the centre, available in a variety of covers. The Mondrian element is rather more peripheral here as it is more concerned with the nature of the New York art market in general. I bought it and read it, but would not really recommend it. A book of excellent short stories. It took a while to get hold of a copy of this one, as discussed here. ... in his own lifetime [Mondrian] had been portrayed in various novels, such as Maalstroom (Maelstrom) by Henriëtte Mooy, De Vader en de Zoon (The Father and the Son) by Louis Saalborn and Michel Seuphor's Les évasions d'Olivier Trickmansholm (The Escapes of Olivier Trickmansholm), as well as an inane crime story that appeared in Het gulden Meisjesboek (The Golden Girl's Book). Written and Presented by Matthew Collings, Directed by Janice Sutherland.Phaidon, 1995. This is the only one I have actually watched and it is excellent. Highly recommended. It includes analysis, comments, anecdotes and reminiscences from many of the best known writers on Mondrian, Blotkamp, Bois and Robert Hughes; the sons of Holtzman and Janis, and the photographer Arnold Newman. There is one review on Amazon which pans this film. For books in print, try Amazon.com in the US. They also handle second-hand books. For Mondrian items of all sorts, eBay is always worth a try. [21Apr12] Chegg Books have asked to be included too. [13Feb13] And so has Direct Textbook.